I’m not what you’d call a risk taker. In fact, I’m more along the lines of a classic goody-goody. The worst thing my teachers would say about me on a report card was that I could sometimes get “too talkative”. The most daring thing I’d do in class would be passing notes. I didn’t lie to my parents or get trashed at parties in high school. You get the picture. To this day I’m still an avid ruler follower. I don’t have major regrets in life based on my behavior. So why am I painting such a lame picture of myself? Because for some reason I’m incredibly risk-adverse in life, but very bullish with money. I suddenly realized how much I defied a major millennial financial stereotype. I’m not afraid of the stock market. In fact, I’m afraid not to be investing enough. It bothers me to have too much of my money sitting in my savings account. I began to analyzing my bullish feelings towards money and came to the same conclusion I always do when it comes to my relationship with finances. It’s my parents’ doing. The stock market crash in 2008 h appened my first year in college. I rarely saw my parents during this time of my life because I lived in the United States while they lived in China. There was no going home on weekends for me. Instead, I got to head home (to China) during Christmas vacation and summer vacation. I’d get to see my Dad a handful of times in between when he’d come to America on business trips. Suffice to say, I never had to be around tense conversations about money as everyone started to see their stocks plummet. I was almost blissfully unaware anything was happening other than hearing the occasional senior stress about finding a job after graduation. 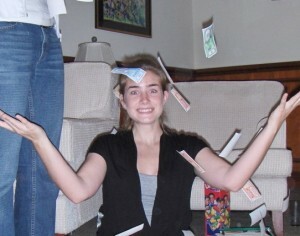 It’s easy to tell I didn’t major in finance or business in college. By the time I tuned into the world’s financial panic, it had probably been about a year since the stock market took a major tumble. And yet, I didn’t feel concerned about my parents’ financial state. 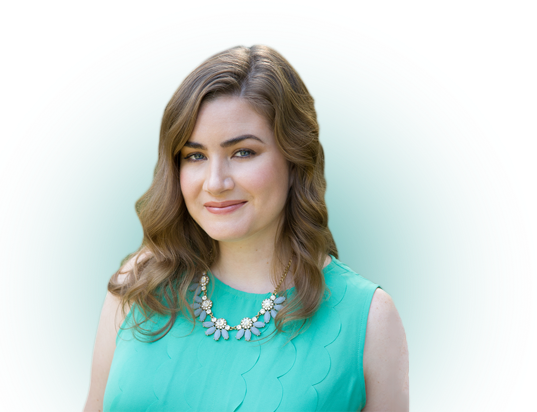 My home had always been relatively open about money, and while I didn’t know exactly how much my Dad made, I trusted my parents would be transparent about any financial difficulties. Still, I figured it would make sense to check in. My Dad and I were driving along in the car one summer during my family’s home leave (when we’d all visit the States). I started to ask basic questions about investing and the panic the world seemed to be experiencing. In his infinite wisdom, my Dad turned to me and nonchalantly said how much money he and my mom lost in the market in 2008. “How are you so calm about losing that much money,” I sputtered. By leaving his money sitting pretty, and making some savvy buys during the crash, my Dad ended up coming out of 2008 very much ahead. I didn’t start investing until a couple years after this poignant conversation (one big life regret), but my Dad’s words have made me a rather bullish investor. I don’t take major risks with my investments, but I do put far more into the market than your average millennial. Dips in the market don’t send me running for the panic button. I believe investing is not only a risk worth taking, but also necessary for financial wellness. My money certainly deserves better than a high interest savings account (even those accounts with more than one percent). 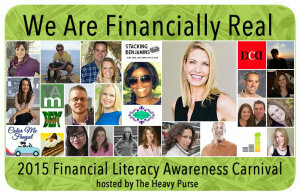 Read other stories of getting “Financially Real” and celebrate financial literacy month! “But what gets you in trouble is when you get scared and try to take all your money out.” This is incredible advice! One of the best lesson a person can learn about the market is to stay the course. Even better than not taking it out is continuing to invest when times are tough (i.e. the market is down). That’s when the big returns can come. 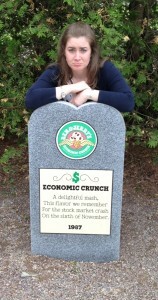 We kept investing through the recession and now those dollars have brought a big return. I love that you are a millennial who loves to invest and you share that passion with other millennials. I have too many clients who are scared of investing but yet they won’t even try it to get comfortable with it. Yes, the markets will go up and down and sometimes very dramatically, this has always happened and will always happen, but over time you will make money you just have to take that first step and invest. From being talkative in school to being an investor, what a transition. It is good to know that you’re making your money work for you by investing and not just leaving it in savings account. Congrats! Nice move. I guess I’m pretty bullish too. One of the reasons I’ve been “broke” for so long is because I put pretty much EVERYTHING into investments. Haha. Making more mean means I’ve been funding some more short term savings recently, but I’m still heavily invested and it’s served me well in terms of growth and net worth. Erin, you are SO lucky to have such wise parents! Too many people do like your dad said and freak out during a crash, taking what little they have left out of the market. That is the WORST thing to do! Many of the world’s wealthy are wealthy because the knew the value of a stock market crash and took advantage of it. They say when others cry you should buy. Glad you learned that early on, it will work wonders over several decades. I am the same way…I’m a rule follower and risk averse but when it comes to investing in the stock market, I’m also “bullish.” I don’t gamble on picking hot stocks and just stick to index funds but I know some people who are scared of the stock market and leave their money in the bank earning practically nothing. I’m only 35…yea I’m sure that seems old to a millennial =) but I’ve invested in the stock market for about 15 years and saw the tech bubble burst and the 2008 recession…your dad is right, it’s cyclical. Just stay the course and ignore the noise. Like your friend, I was also afraid to start investing. I just didn’t want to lose the little money that I had. But I soon realized that if I wanted to make my money grow I needed to get rid of that fear. I’m so glad that I did because I am know looking for ways to make more money so I can invest more! Love this, Erin! You have no idea how many conversations I have with scared investors who wanted to pull every penny out of the market. And it’s absolutely fine (and normal) to be scared and have a thorough review of your portfolio to give you peace of mind. As your Dad shared, is the best time to add to your portfolio because things are “on sale” and harvesting losses appropriately can actually save you (taxes) money in the end. I’m so glad your father has been talking to you about money since you were child and is so transparent about the family money. It’s clear that these talks have helped you feel far more confident than your peers. And I was (and am) a rule follower too and I’m also bullish about money! 🙂 Thanks for participating in the carnival, Erin. I always appreciate your support! What an excellent money lesson to learn from your Dad! I do notice that many millennials are scared of stocks. I guess I’m of the generation that always expects the good old days (Bill Clinton era). I lost quite a chunk of my IRA in 2008, but just left it alone and kept adding to it and it’s rebounded in spades. So glad I didn’t follow the herd and pull out at the bottom. What a wonderful insight from your father!! I wish my parents had imparted me with the same lessons, but as they didn’t I’m thankful I didn’t follow their example. I have to admit I get excited when I see a swing in my retirement account balances of several hundred or 1k dollars – even if it’s DOWN – because I’m just so happy that we have enough money in the market to move that much in single day. 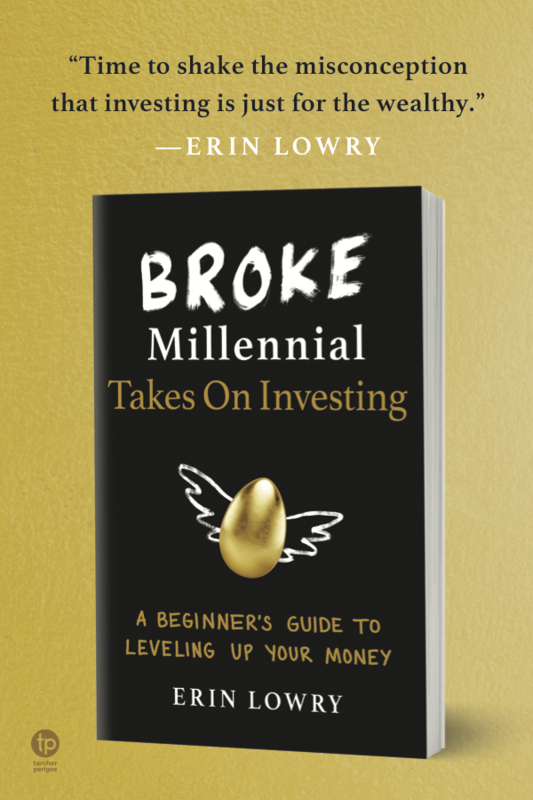 I see the statistics as well on Millennials being risk-averse, but I have to say the vast majority of my peers seem to be very excited about investing aggressively for the long term. Whether or not they all follow through I’m not sure, but they seem pretty bullish in conversation. Glad to hear you started investing so early =) I didn’t start until my lateish 20s and that really set me back. I’ve more than made up for it now, but it took a while! I wish my parents had been more bullish. Thanks to the Alaska Permanent Fund dividends, I had a healthy amount of cash in my bank account by the time I graduated. It never got put in something as simple as CDs! So I’m still conservative with my money. On the other hand, I’m the only wage earner, and we’ve been too busy putting out fires to really do *anything* with our money. After this year’s $25,000 in oral surgery expenses, I want to get better about funding our IRAs. Frankly, it’s a miracle I was able to overcome my knee-jerk terror of risk and choose moderate risk on our Roth. I don’t want any risk, but the logical (aka not screaming) part of my brain knows that the market is cyclical, like your dad said. I guess I’m a bit more like your friend, I really don’t like to lose money when investments drop. But I know that I need to invest anyway to make any kind of a gain too. So I made a balanced portfolio with some money in higher risk and higher return funds and some in more conservative funds. It’s a good mix for me. I love that your dad was so calm. What a great role model. That’ll serve you well for a long, long time…. Sometimes you can’t blame investors for getting scared. They just need a little encouragement. You’re lucky to have gotten such great advice from your Dad. I’ve always been scared of investing but I’m learning not to. I wasn’t too tuned in back in 08/09 either. I was also only 14. My family is open about money to a fault. My dad lost $120k in ten minutes back then. The stock market can be brutal if not prepared. I still think market timing is semi-important. There’s a big difference in your investment returns if you bought in 2007 versus if you bought in 2009. But I guess that in the big picture of things, it’s not that important. If you hold for several decades the returns won’t be that much different. Are millennials usually scared to invest? I have heard that a few times but it doesn’t seem to make any sense to me. Are we different then other generations? Were others much more willing? Dips in the market makes me feel iffy too but I use it as an opportunity to buy blue chip stocks at a bargain.